B lymphocytes are a potential alternative to dendritic cell immunotherapy, with the advantages of relative abundance in peripheral blood and the ability to function as APCs. Although B cells express multiple receptors that induce costimulatory molecules, B cell vaccine studies have focused primarily on CD40 stimulation. To optimize the potential efficacy of B cell vaccines (Bvac), we compared the capacity of differentially stimulated B cells to induce Ag-specific CD8+ T cell responses in vivo. CD40- or TLR7-stimulated B cell APCs induced similar CD8+ T cell responses, but costimulation through the BCR and TLR7 produced a more effective Bvac as measured by T cell stimulation and the protection of mice from an infectious pathogen. This increased effectiveness depended upon enhanced production of IL-6 by BCR plus TLR7-stimulated B cells. These findings reveal alternative stimulation strategies for the production of effective Bvac and identify a key role for IL-6 in B cell Ag presentation and cellular vaccines. The ability to present Ag to naive T cells, the relative ease of isolation from peripheral blood, and the potential for in vitro activation and expansion make B lymphocytes an attractive alternative to dendritic cells (DCs)4 in human immunotherapy. Treating APCs with specific activation stimuli and Ags ex vivo followed by reintroduction into the body has been proposed as a possible immunotherapy to combat cancer and infectious diseases for which conventional vaccines have proven ineffective. Activation stimuli promote the up-regulation on APCs of costimulatory molecules such as CD80 and CD86 and enhance production of the cytokines necessary for optimal T cell activation (1, 2, 3). Previous reports demonstrate that Ag-presenting B lymphocytes stimulated through the TNFR superfamily member CD40 up-regulate the expression of CD86 and proinflammatory cytokines. Consistent with this expression is the ability of peptide-pulsed B cells to induce CD8+ T cell responsiveness (4, 5, 6, 7). Although these studies offer an important insight into the potential use of B cells in immunotherapy, it is generally believed that B cells are much less effective APCs than DCs, and thus not as attractive as candidates for cellular vaccines. However, we considered the possibility that the optimal signals for ex vivo activation of B cells as APCs have not been thoroughly investigated. In addition to CD40, B cells can be activated through engagement of the BCR and innate immune receptors such as the TLRs. The stimulation of B cells through these receptors can induce the expression of costimulatory molecules and the production of proinflammatory cytokines such as IL-6 and TNF-α (8, 9, 10, 11). Although BCR stimulation alone can in some circumstances induce B cell anergy, stimulation through the BCR together with any of the multiple TLRs expressed by B cells significantly enhances B cell effector functions, including cytokine production, Ab production, and surface molecule up-regulation (10, 11). The use of TLR agonists as vaccine adjuvants is currently being tested (12, 13). Initial studies have focused upon agonists of the endosomal TLRs 7, 8, and 9. 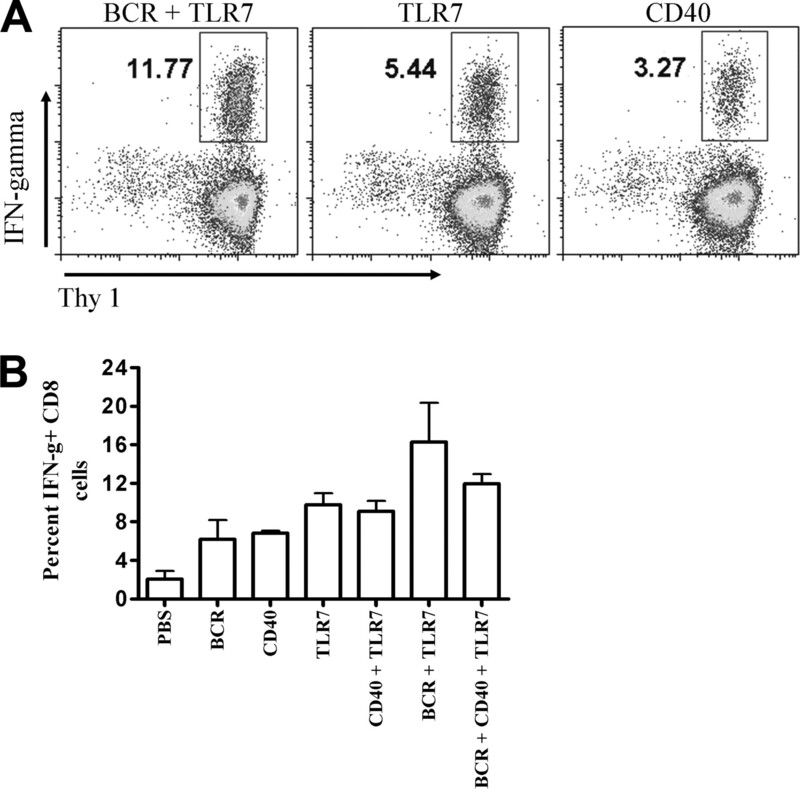 B lymphocytes readily respond to the TLR7 agonist R848, which has been shown to enhance B cell function alone and strongly synergize with BCR or CD40 stimulation (8, 14). To identify clinically relevant B cell vaccine (Bvac) stimulation strategies and to optimize the potential for B lymphocyte Ag presentation and immunotherapy, we have compared the CD8+ T cell stimulatory capacities of differentially stimulated Ag-pulsed B cells and extended this investigation to in vivo responses to an infectious pathogen. C57BL/6 and IL-6-deficient (C57BL/6 background) mice were purchased from The Jackson Laboratory and housed in a pathogen-free facility. All cells were incubated in BCM-10 medium (9). Use of mice in this study was in accordance with a protocol approved by the University of Iowa Animal Care and Use Committee (Iowa City, IA). High density splenic B cells for use as Bvacs were purified by Percoll gradient isolation (15) followed by the removal of CD43+ cells using magnetic isolation (Miltenyi Biotec). B cell purity was >99.3% as determined by CD19 expression analyzed by flow cytometry. CD11c+ cell contamination was undetectable. Purified B cells were suspended at 2 × 106 cells/ml and stimulated with the following reagents: 2 μg/ml goat F(ab′)2 anti-mouse μ-specific Ab (for BCR stimulation; Jackson ImmunoResearch Laboratory), 1 μg/ml R848 (TLR7 agonist; Alexis Biochemicals), 5 μg/ml rat anti-mouse CD40 mAb clone 1C10 (the 1C10 hybridoma was a gift from Dr. F. Lund, Trudeau Institute, Saranac Lake, NY); either in combination or individually as described in the figure legends. After 22 h of stimulation the OVA peptide SIINFEKL was added and the cells were incubated two additional hours. Cells were then washed with 20 ml of PBS and resuspended in PBS. OVA peptide-pulsed cells (2 × 105 cells/mouse) were adoptively transferred i.v. into naive C57BL/6 mice. Two strains of LM expressing the OVA peptide SIINFEKL were used in these experiments, virulent LM and attenuated LM (LMA). Mice were infected i.v. with either 1 or 5 × 105 CFU virulent LM (5 × LD50) in PBS (16). On the indicated days the mice were sacrificed and liver samples were collected, weighed, and homogenized in 7 ml of 2% Igepal and plated at log dilutions in PBS on tryptic soy agar plates containing 100 μg/ml streptomycin. Plates were incubated at 37°C and colonies per gram of liver were enumerated. LMA was injected i.v. at 1 × 107 per mouse in sterile PBS. Four days postinfection the mice were sacrificed, spleens were collected, homogenized, and depleted of RBC, and the resulting splenocytes were pulsed with or without 1 μg/ml OVA peptide for 6 h at 37°C. Cells were then stained for IFN-γ-producing CD8+ T cells as described below. Splenocytes harvested from infected or vaccinated mice were pulsed with or without OVA peptide for 6 h at 37°C in the presence of 0.5 μg/ml GolgiPlug (BD Biosciences). Cells were then stained for expression of CD8α (mAb 53-6.7; BD Biosciences) and Thy1.2 (mAb 53.21; BD Biosciences) followed by intracellular staining for IFN-γ (mAb XMG1.2, BioLegend) as previously described (17). Expression of the IL-6R subunit CD126 on purified CD8+ T cells was monitored using van anti-CD126 mAb (clone 7715A7) purchased from BioLegend followed by a FITC-conjugated goat anti-rat IgG2b Ab (SouthernBiotech). In brief, 1 × 106 purified CD8+ T cells at 100 μl per sample were incubated with either 1 μg of anti-CD126 mAb or rat IgG2b isotype control mAb (SouthernBiotech) for 30 min at 4°C. Cells were then washed three times in 5 ml of FACS buffer (PBS containing 1% FBS and 0.01% NaN3). Cell pellets were then resuspended at 100 μl and incubated with 1 μg of goat anti-rat IgG2b mAb for 30 min at 4°C, washed three times in 5 ml of FACS buffer, and analyzed by flow cytometry. B lymphocytes were isolated and stimulated as described above. Supernatants were collected after 24 h of stimulation and analyzed in a 20-cytokine multiplex ELISA (BioSource) according to the manufacturer’s protocol. Analyte amounts were determined using the multiplex reader Luminex 2000 (Bio-Rad). Flat-bottom, 96-well plates were coated with 1 μg/ml anti-CD3ε Ab (clone 145-2C11; eBioscience) in PBS (17). CD8+ T cells harvested from the spleens of naive C57/Bl6 mice using negative MACS separation (Miltenyi Biotec) were seeded at 1 × 105 per well in anti-CD3 Ab-coated 96-well plates. Recombinant mouse IL-6 (eBioscience) was added to wells in triplicate. For testing of conditioned medium, 50 μl of supernatants collected from stimulated B cells (see above) with or without anti-IL-6 Ab (clone 20F3.11) after 24 h were added to CD8+ T cells (final volume of 200 μl). After 72 h of stimulation, 0.1 μCi of [3H]thymidine was added to each well and further incubated for 12 h. Cells were then harvested and a scintillation counter used to evaluate 3H incorporated into DNA. We hypothesized that different types of stimulation of B lymphocytes used in vaccines may result in different effectiveness of B cells as APCs and, hence, induce different levels of CD8+ T cell secondary responses. Mice that had received differently stimulated Bvacs were challenged with attenuated LM expressing the OVA peptide SIINFEKL. Splenocytes of these mice were analyzed for OVA-specific CD8+ T cells 4 days postinfection. All Bvac-treated mice displayed higher levels of Ag-responsive CD8+ T cells than the PBS-treated group (Fig. 1⇓). These data indicate that the various Bvacs sensitized mice to Ag, resulting in an enhanced secondary T cell response upon challenge. Although all Bvac groups were able to generate secondary responses, there were differences in the magnitude of the responses induced by the different groups (Fig. 1⇓). Of particular note, B cells stimulated through CD40, the reported method for activating B cells, induced the lowest T cell secondary response of all groups tested, indicating that other stimulation strategies may be more effective for Bvac. Secondary CD8+ T lymphocyte responses to Bvacs. Mice were injected with 2 × 105 Ag-pulsed B lymphocytes stimulated through the indicated receptors for 24 h. Forty-two days after Bvac treatment mice were infected with attenuated LMA expressing SIINFEKL. Four days after LMA infection, spleens were removed and CD8+ T lymphocytes were analyzed for responsiveness to the OVA peptide SIINFEKL by intracellular IFN-γ staining. A, Dot plots of pregated CD8+ T lymphocytes expressing both Thy1.2 and IFN-γ. Plots are representative data from one mouse per treatment group (n = 3). B, Graph represents the percentage of CD8+ T lymphocytes expressing IFN-γ (IFN-g+) in response to SIINFEKL (n = 3 per group). The data are representative of three separate experiments. The Bvac BCR plus TLR7 treatment resulted in the most effective vaccine for inducing T cell secondary responses. This result is consistent with previous reports of B cell-enhanced cytokine production and surface molecule up-regulation upon BCR and TLR dual stimulation (8, 10, 11). The treatment of B cells with the TLR7 agonist R848 alone (BvacTLR7) resulted in a higher T cell response than the BvacCD40 group, suggesting that the use of TLR agonists may be an effective and practical alternative to CD40 stimulation. BvacBCR plus TLR7 was an effective B cell vaccine, although its ability to induce a secondary response was ∼40% of that of DC vaccine (supplemental Fig. 1).5 However, this comparison does not consider the difficulty of isolating DCs for clinical use. To focus on optimizing Bvac effectiveness, we limited our treatment groups to stimulation via BCR plus TLR7, CD40, or TLR7 alone. These groups were chosen as representatives of the most effective stimulation (BCR plus TLR7), the published standard (CD40) (18), and a clinically viable option to CD40 (TLR7), respectively. To determine whether enhanced secondary responses of CD8+ T cells to Bvac-treated groups resulted in enhanced protection from an infectious pathogen, Bvac-treated mice were challenged with recombinant, 5 × LD50 virulent LM expressing the OVA peptide SIINFEKL. Three days postinfection the clearance of bacteria from the liver of these animals was analyzed. Bvac-treated groups displayed better clearance than controls (Fig. 2⇓). BvacBCR plus TLR7 treatment reduced bacterial burden by an average of 97% (1.41 × 105 CFU/g liver) compared with naive mice (4.17 × 106 CFU/g liver), whereas BvacCD40 and BvacTLR7 treatments reduced the burden by 93% (2.74 × 105 CFU/g liver) and 84% (6.79 × 105 CFU/g liver), respectively. Although there were no statistical differences in bacterial burden between Bvac-treated groups, the trend toward lower bacterial burdens was consistent with the level of CD8+ T cell activation induced by the individual vaccines as seen in Fig. 1⇑. Interestingly, despite a lower OVA-specific CD8+ response, the clearance of pathogen in BvacBCR plus TLR7 treated mice was similar to that of DC vaccine-treated mice (supplemental Fig. 2). Bvac-induced protection against LM infection. Mice were injected with 2 × 105 Ag-pulsed B lymphocytes stimulated through the indicated receptors for 24 h. Forty-two days after Bvac treatment, mice were infected with virulent LM expressing SIINFEKL. Four days after LM infection, livers were collected, weighed, homogenized, and cultured to determine LM CFU per gram of liver. The p value was calculated using a one-sided Wilcoxon rank and sum test. The data are representative of two separate experiments. T cell activation by APCs is dependent upon presentation by peptide-loaded MHC molecules (signal 1) as well as costimulatory molecules (signal 2). We considered the possibility that the difference between Bvac groups might be attributed to differential B cell expression of MHC class I or costimulatory molecules. However, no difference in either MHC class I or CD86 expression was seen between variously treated B cell groups at the time of Bvac administration (data not shown). Because no detectable differences existed between groups with regards to signals 1 and 2, we focused our attention on signal 3, cytokine production. Differences between groups could be attributable to variations in acute phase cytokine production, such as IL-1α/β, TNF-α, or IL-6. Although no detectable IL-1 was produced by the Bvac groups (data not shown), both TNF-α and IL-6 were produced in measurable amounts (Fig. 3⇓). TNF-α was produced at low levels and did not correlate with the Bvac performance (Fig. 1⇑). In contrast, IL-6 production correlated well with vaccine efficacy (Fig. 3⇓). To ascertain whether IL-6 played a causal role in CD8+ T cell responses, CD8+ T cells were analyzed for IL-6 receptor (CD126) expression and proliferative responses to rIL-6. Negatively isolated splenic CD8+ T cells expressed the IL-6R-specific subunit CD126 (Fig. 4⇓) and demonstrated an enhanced proliferative response to TCR engagement in the presence of IL-6 (Fig. 4⇓). Consistent with previous findings, proliferative enhancement occurred in an IL-6 dose-dependent manner, indicating a direct effect of IL-6 on CD8+ T cells (19). Production of IL-6 and TNF-α by Bvac groups. B cells (1 ml at 2 × 106 cells/ml) were stimulated with F(ab′)2 anti-mouse IgM Ab fragment plus R848, R848 alone, or anti-CD40 mAb. The supernatants were collected after 24 h of stimulation and subjected to cytokine analysis as described in Materials and Methods. Effects of rIL-6 on CD8+ T lymphocytes. Purified CD8+ T cells were analyzed for proliferation induction by rIL-6 and conditioned medium. A, Expression of CD126 by CD8+ T cells; dark line, isotype control; gray line, anti-CD126 Ab. B, Proliferation of TCR-stimulated CD8+ T cells with and without IL-6; No Stim, No stimulation. 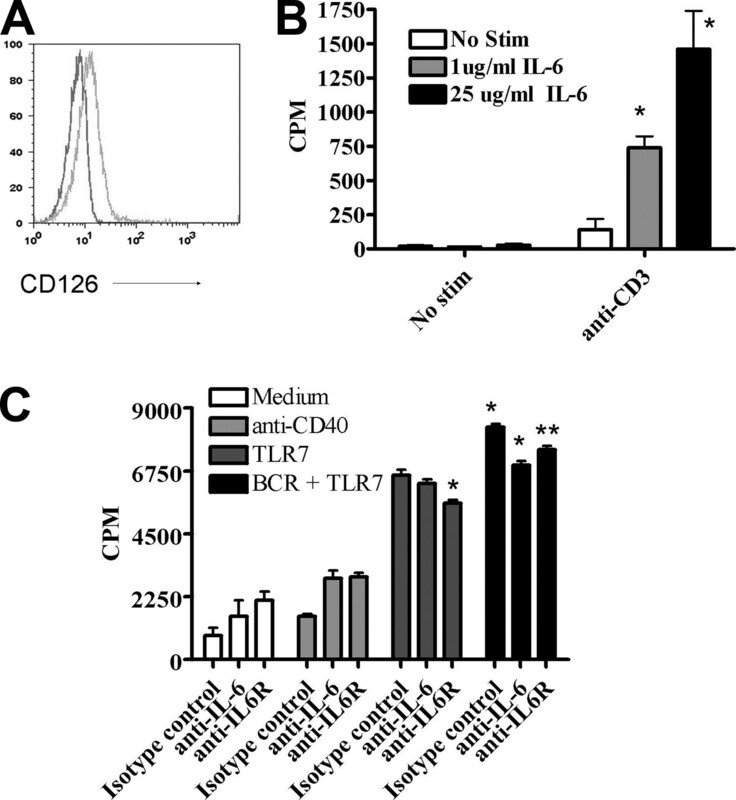 C, Proliferation of TCR-stimulated CD8+ T cells with conditioned medium from differentially stimulated B cells with or without anti IL-6 or IL-6R blocking Ab or isotype control. *, p < 0.05 (standard Student’s t test); **, p < 0.05 (one-sided Student’s t test). Each graph is representative of three experiments. To further determine the effects of Bvac-produced IL-6, CD8+ T cells were stimulated with anti-CD3 mAb and treated with conditioned medium from differentially stimulated B cells. 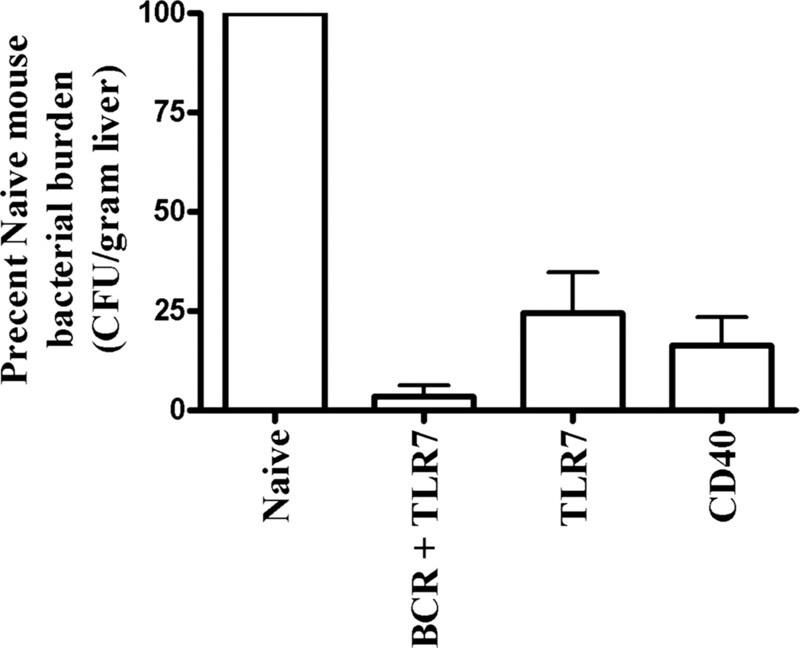 The incubation of CD8+ T cells with medium from CD40-, TLR7-, and BCR plus TLR7-stimulated B cells enhanced the proliferative effects of TCR stimulation (Fig. 4⇑). Importantly, the stimulatory capacity of the different supernatants was consistent with our previous CD8+ T cell activity and protection results, as conditioned medium from BCR plus TLR7 stimulated B cells induced higher levels of CD8+ T cell proliferation than that from TLR7 or CD40 alone. The ability of each supernatant treatment to enhance T cell proliferation was partially reduced by the addition of anti-IL-6 Abs, indicating the importance of IL-6 but also suggesting that other factors produced by B cells may contribute to CD8+ T cell proliferation (Fig. 4⇑ and supplemental Fig. 3). These results demonstrate that the production of IL-6 is an important component of a cellular vaccine. 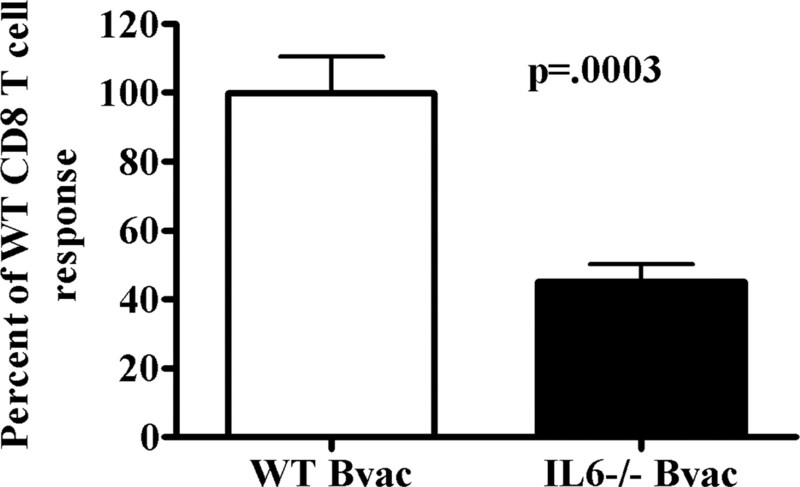 To ascertain whether IL-6 produced by the Bvac played a causal role in T cell responses in vivo, BvacBCR plus TLR7 derived from IL-6 deficient mice were compared with BvacBCR plus TLR7 derived from IL-6 sufficient mice. The T cell response induced by the IL-6-deficient Bvac was reduced by ∼ 40% (Fig. 5⇓). Again, these data demonstrate the importance of the production of IL-6 during CD8+ T cell responses to cellular vaccines. Comparison of IL-6-sufficient and -deficient B cell vaccines in generating CD8+ T lymphocyte responses. 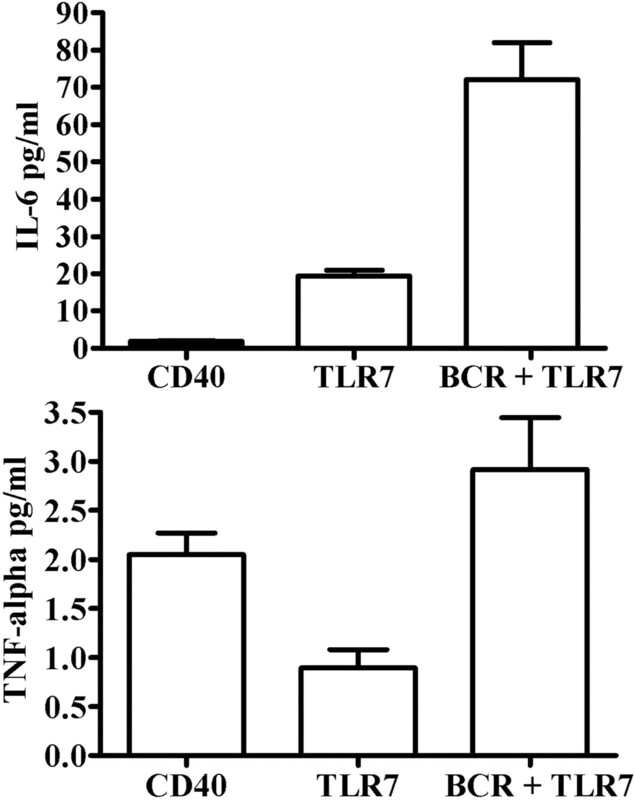 B lymphocytes were purified from both IL-6-deficient and -sufficient mice, stimulated for 24 h through both the BCR and TLR7, pulsed with OVA peptide, and injected into naive mice. Forty-two days after Bvac treatment, mice were challenged with attenuated LMA expressing SIINFEKL. Four days postinfection spleens were collected and the CD8+ T lymphocytes were analyzed for responsiveness to the OVA peptide SIINFEKL by intracellular IFN-γ staining. Percentage of IFN-γ-positive CD8+ T lymphocytes per mouse are shown. Data are representative of three individual experiments. WT, Wild type. The importance of B cells as APCs has become evident over recent years. B cells have been implicated in multiple sclerosis through the direct enhancement of T cell responses in the absence of Ab production (20, 21). In infectious diseases such as AIDS and bacterial meningitis, B cells have been shown to be important as innate immune cells, again independent of Ab production (22, 23). An important knowledge gap in Bvac usage has been determining the optimal B cell stimulation to produce APCs able to induce an efficacious T cell response. There are three required interactions associated with successful T cell activation: signal 1 (MHC:peptide complex); signal 2 (costimulatory molecules and their receptors); and signal 3 (cytokines and receptors). Although other signal 3 cytokines such as IL-2 are well defined, this is the first report demonstrating an important in vivo requirement for IL-6 as a signal 3 cytokine for CD8+ T cells and reveals another important consideration in the design of Bvacs that promote optimal T cell activation and proliferation. Although data using DCs as cellular vaccines are promising, clinical use of cellular vaccines has yet to yield substantial gains. The requirements of high cell numbers and effective cellular expansion and activation remain substantial obstacles in effective DC-based immunotherapy (24). B lymphocytes display many of the characteristics desired for use in immunotherapy: 1) easily isolated in high numbers; 2) no requirement for differentiation in vitro; 3) ability to present Ag to T cells; and 4) responsive to stimulation using experimental and medicinal compounds. Gaining knowledge about the properties of B cells as APCs will advance our clinical capabilities for cancer or infectious disease immunotherapy. We thank Drs. Laura Stunz and Jon Houtman for critical review and editorial advice during manuscript preparation. ↵1 This material is based upon work supported in part by the Department of Veterans Affairs, Veterans Health Administration, Office of Research and Development and Health, Services Research and Development, Merit Review Award 383 (to G.A.B.). T.J.V.B. received support from an American Cancer Society postdoctoral fellowship (PF-07-067-01-LIB). ↵2 Current address: Department of Chemistry, Pontifical Catholic University of Puerto Rico, Ponce, Puerto Rico. ↵4 Abbreviations used in this paper: DC, dendritic cell; Bvac, B cell vaccine; LM, L. monocytogenes; LMA, attenuated L. monocytogenes. Freeman, G., J. Gribben, V. Boussiotis, J. Ng, V. Restivo, Jr, L. Lombard, G. Gray, L. Nadler. 1993. Cloning of B7-2: a CTLA-4 counter-receptor that costimulates human T cell proliferation. Science 262: 909-911. Boussiotis, V., G. Freeman, G. Gray, J. Gribben, L. Nadler. 1993. B7 but not intercellular adhesion molecule-1 costimulation prevents the induction of human alloantigen-specific tolerance. J. Exp. Med. 178: 1753-1763. Freeman, G., G. Gray, C. Gimmi, D. Lombard, L. Zhou, M. White, J. Fingeroth, J. Gribben, L. Nadler. 1991. Structure, expression, and T cell costimulatory activity of the murine homologue of the human B lymphocyte activation antigen B7. J. Exp. Med. 174: 625-631. Constant, S.. 1999. B lymphocytes as antigen-presenting cells for CD4+ T cell priming in vivo. J. Immunol. 162: 5695-5703. Lapointe, R., A. Bellemare-Pelletier, F. Housseau, J. Thibodeau, P. Hwu. 2003. CD40-stimulated B lymphocytes pulsed with tumor antigens are effective antigen-presenting cells that can generate specific T cells. Cancer Res. 63: 2836-2843. Schultze, J., S. Michalak, M. Seamon, G. Dranoff, K. Jung, J. Daley, J. Delgado, J. Gribben, L. Nadler. 1997. CD40-activated human B cells: an alternative source of highly efficient antigen presenting cells to generate autologous antigen-specific T cells for adoptive immunotherapy. J. Clin. Invest. 100: 2757-2765. Schultze, J., S. Grabbe, M. von Bergwelt-Baildon. 2004. DCs and CD40-activated B cells: current and future avenues to cellular cancer immunotherapy. Trends Immunol. 25: 659-664. Vanden Bush, T., G. Bishop. 2008. TLR7 and CD40 cooperate in IL-6 production via enhanced JNK and AP-1 activation. Eur. J. Immunol. 38: 400-409. Baccam, M., S. Woo, C. Vinson, G. Bishop. 2003. CD40-mediated transcriptional regulation of the IL-6 gene in B lymphocytes: involvement of NF-κB, AP-1, and C/EBP. J. Immunol. 170: 3099-3108. Bishop, G., L. Ramirez, M. Baccam, L. Busch, L. Pederson, M. Tomai. 2001. The immune response modifier resiquimod mimics CD40-induced B cell activation. Cell. Immunol. 208: 9-17. Bishop, G., Y. Hsing, B. Hostager, S. Jalukar, L. Ramirez, M. Tomai. 2000. Molecular mechanisms of B lymphocyte activation by the immune response modifier R-848. J. Immunol. 165: 5552-5557. Vasilakos, J., R. Smith, S. Gibson, J. Lindh, L. Pederson, M. Reiter, M. Smith, M. Tomai. 2000. Adjuvant activities of immune response modifier R-848: comparison with CpG ODN. Cell. Immunol. 204: 64-74. Weeratna, R., S. Makinen, M. McCluskie, H. Davis. 2005. TLR agonists as vaccine adjuvants: comparison of CpG ODN and Resiquimod (R-848). Vaccine 23: 5263-5270. Haxhinasto, S., G. Bishop. 2004. Synergistic B cell activation by CD40 and the B cell antigen receptor: role of B lymphocyte antigen receptor-mediated kinase activation and tumor necrosis factor receptor-associated factor regulation. J. Biol. Chem. 279: 2575-2582. Bishop, G., L. Ramirez, T. Waldschmidt. 1994. Differential responses to Ig and class II-mediated signals in splenic B cell subsets from normal and autoimmune mice. Int. Immunol. 6: 1049-1059. Pope, C., S. Kim, A. Marzo, D. Masopust, K. Williams, J. Jiang, H. Shen, L. Lefrancois. 2001. Organ-specific regulation of the CD8 T cell response to Listeria monocytogenes infection. J. Immunol. 166: 3402-3409. Kraus, Z., J. Haring, G. Bishop. 2008. TNF receptor-associated factor 5 is required for optimal T cell expansion and survival in response to infection. J. Immunol. 181: 7800-7809. Shen, S., Z. Xu, X. Qian, Y. Ding, L. Yu, B. Liu. 2008. RNA-electroporated CD40-activated B cells induce functional T-cell responses against HepG2 cells. Eur. J. Cancer Care (Engl.) 17: 404-411. Sepulveda, H., A. Cerwenka, T. Morgan, R. Dutton. 1999. CD28, IL-2-independent costimulatory pathways for CD8 T lymphocyte activation. J. Immunol. 163: 1133-1142. Nikbin, B., M. Bonab, F. Khosravi, F. Talebian. 2007. Role of B cells in pathogenesis of multiple sclerosis. Int. Rev. Neurobiol. 79: 13-42. Racke, M.. 2008. The role of B cells in multiple sclerosis: rationale for B-cell-targeted therapies. Curr. Opin. Neurol. 21: (Suppl. 1):S9-S18. Schlaepfer, E., A. Audige, H. Joller, R. Speck. 2006. TLR7/8 triggering exerts opposing effects in acute versus latent HIV infection. J. Immunol. 176: 2888-2895. Morales-Aza, B., S. Glennie, T. Pereira Garcez, V. Davenport, S. L. Johnston, N. Williams, R. Heyderman. 2009. Impaired maintenance of naturally acquired T cell memory to the meningococcus in individuals with B cell immunodeficiency. Blood : 4206-4212. Nencioni, A., F. Grunebach, S. Schmidt, M. Muller, D. Boy, F. Patrone, A. Ballestrero, P. Brossart. 2008. The use of dendritic cells in cancer immunotherapy. Crit. Rev. Oncol. Hematol. 65: 191-199.